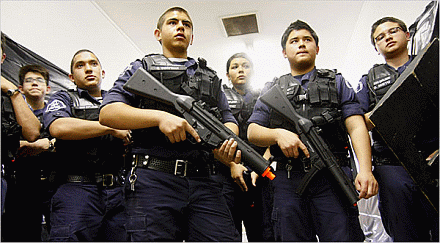 Did FEMA Create a Youth Army? Q: Did the Department of Homeland Security create a “standing army of government youth” known as FEMA Corps. A: No. FEMA Corps is a civilian operation within AmeriCorps, a federal community service program. FEMA Corps prepares and responds to disasters. Its members, ages 18 to 24, carry no weapons. Tell me this is not true. October 7, 2012. Vicksburg . 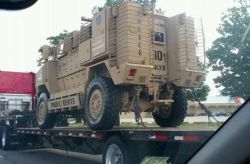 The federal government calls them FEMA Corps. 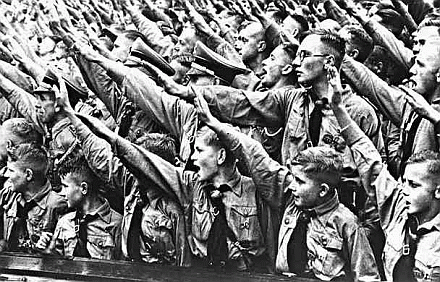 But they conjure up memories of the Hitler Youth of 1930’s Germany . Regardless of their name, the Dept of Homeland Security has just graduated its first class of 231 Homeland Youth. Kids, aged 18-24 and recruited from the President’s AmeriCorp volunteers, they represent the first wave of DHS’s youth corps, designed specifically to create a full time, paid, standing army of FEMA Youth across the country. The second problem with this announcement and program is its timing. Over the past two years, President Obama has signed a number of Executive Orders suspending all civil and Constitutional rights and turning over management of an America under Martial Law to FEMA. Also in that time, domestic federal agencies under DHS, including FEMA, have ordered billions of rounds of ammunition as well as the corresponding firearms. Admittedly, these new weapons and ammunition aren’t to be used in some far-off war or to fight forest fires in California , but right here on the streets of America. A few readers sent us this email, which dresses up conspiracy theories with unrelated photographs and selected snippets from a government press release. The gist of the email is that the federal government is stockpiling bullets, instituting martial law and arming youths in President Barack Obama’s army of “Brown Shirts” — none of which is true. This email is the most recent incarnation of a claim we debunked in 2008 and 2010. The conspiracy theory stems from a 2008 speech that then-candidate Obama gave in Colorado. He talked about building up “a civilian national security force that’s just as powerful, just as strong, just as well-funded” as our military force. The email says the Department of Homeland Security created a “paid, full time, standing army of government youth.” And the email quotes — correctly — from a DHS press release announcing FEMA Corps’ first graduating class. But that’s about all the email gets right. And the photo comes not from DHS — as the email claims — but from a 2009 New York Times article. The story is about a law enforcement education program that is affiliated with the Boy Scouts of America and has nothing to do with FEMA Corps. The Law Enforcement Exploring program teaches crime-fighting skills to persons between the ages of 14 and 20 who are considering a career in law enforcement. The Times profiled a southern California chapter that partnered with U.S. Border Patrol and local police. They simulated a raid on a marijuana field, which the newspaper photographed. FEMA Corps, on the other hand, is a civilian operation for persons between the ages of 18 and 24. It is a unit within AmeriCorps, a community service program. FEMA Corps, which will grow to 1,600 members, is solely devoted to preparing for and responding to disasters. Corps members work with the Federal Emergency Management Agency, which dispatches them to disaster areas. They recently helped Hurricane Sandy victims in Long Beach, N.Y., registering them for federal assistance. They do not carry guns — much less travel in armored fighting vehicles. In fact, the AmeriCorps handbook, which applies to FEMA Corps, prohibits members from possessing firearms or any other weapon. The email, nonetheless, attempts to connect FEMA Corps to an overblown claim about the government’s recent ammunition purchases. DHS has indeed ordered hundreds of millions of rounds of ammunition. But there is less here than meets the eye. And that’s according to the National Rifle Association and the office of Republican Congressman Lynn Westmoreland of Georgia. 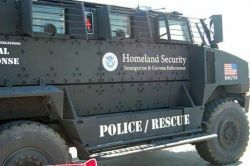 The Department of Homeland Security recently contracted to buy up to 450 million rounds over the next five years. But DHS was making a first-time bulk order for all of its law enforcement agencies to save money. Those agencies include the Secret Service, the Transportation Security Administration and U.S. Customs and Border Enforcement, among many others. Update, Feb. 14, 2014: The Government Accountability Office definitively shot down claims of a “drastic spike” in Homeland Security’s ammunition purchases. In a January 2014 report, the GAO said Homeland Security’s annual ammunition purchases have declined every year since fiscal year 2009, dropping from 132.9 million rounds in 2009 to 84.4 million in 2013. The email also links FEMA Corps to the false claim that Obama issued executive orders that institute martial law and give unchecked powers to FEMA. As we’ve written before, Obama’s orders do no such thing. He issued one executive order that exercised his office’s power to prepare the nation for an emergency. The order doesn’t institute martial law. It doesn’t even mention FEMA. Press release. “Welcome to the FEMA Corps Inaugural Class.” Department of Homeland Security. 14 Sept. 2012. U.S. Code, 2003 Edition. “15 U.S.C., Title 15, Chapter 76, Section 5001, penalties for entering into commerce of imitation firearms.” 2003. Steinhauer, Jennifer. “Scouts Train to Fight Terrorists, and More.” The New York Times. 13 May 2009. “Program and Resource Guide for Adult Leaders.” Law Enforcement Exploring program. July 2011. “AmeriCorps NCCC FEMA Partnership.” About AmeriCorps. Accessed Nov 2012. “FEMA Corps FAQ’s.” FEMA. 20 June 2012. Stilts, Josh. “Sandy victims helped through FEMA Corp by Pittsfield man.” The Berkshire Eagle. 18 Nov 2012. “AmeriCorps NCCC Memeber Handbook.” AmeriCorps. Jan 2011. “Federal Law Enforcement Agencies Buy Ammunition.” National Rifle Association Institute for Legal Action. 17 Aug 2012. Doran, Kevin. “DHS Buys in Bulk to Save You Money.” Office of U.S. Rep. Lynn Westmoreland. Accessed Nov 2012. Finley, Ben. “Obama’s Executive Orders.” FactCheck.org. 25 Sept 2012. Jackson, Brooks. “Obama’s ‘National Security Force.’ ” FactCheck.org. 11 Nov 2008. Novak, Viveca. “Obama’s ‘Private Army.’” FactCheck.org. 7 April 2010. Obama, Barack. Executive Order 13603. 16 Mar 2012.